It is an outstanding exhibition “Journey through the afterlife: ancient Egyptian Book of the Dead” at the British Museum until the 6th of March 2011. It is the major autumn exhibition at the British Museum offering a complete survey of the beliefs of the ancient Egyptian netherworld. The Book of the Dead is a funerary collection of spells, hymns and instructions made to assist a deceased used in ancient Egypt. The exhibition galleries proceeds in an intended way ending with the Greenfield Papyrus, a 37 metres Book of the Dead and including others masterpiece like the famous papyri of Ani and Hunefer. For ancient Egyptian death was a passage to another world dominated by two gods, Ra and Osiris. The Book of the Dead is the common name given to the ancient Egyptian funerary text called the “Spells of Coming Forth by Day”. Usually it was written on a papyrus scroll and placed in the coffin, or burial chamber, of the deceased, sometimes painted in the coffin. The Book of the Dead was a collection of around 200 magical spells, hymns to gods and instructions. It was made to assist the deceased to pass through obstacles in the afterlife and eventually make certain the eternal life. The Book of the Dead was used for over 1500 years between c. 1600 BC and 100 AD. The British Museum has the largest collection of Books of the Dead of the world. The exhibition includes the Greenfield Papyrus, the longest Book of the Dead in the world. It measures 37 metres in length and has never been shown publicly in its entirety before. Also on display will be the famous papyri of Ani and Hunefer. The exhibition starts with a gallery about “Crossing the boundaries” were the basic concepts of the ancient Egyptian afterlife are explained. In the second room is “Preparing for the afterlife”. Ancient Egyptians created a wide range of afterlife practices, where rituals and magic play important roles. There was also an evolution on funerary writings. Here notably the famous Papyri of Ani and Anhai and the Coffin of Seni. The third gallery “The day of burial” deals with mummification techniques and practices like the opening of the mouth. Remarkable are the Coffin of Henutmehyt and the Papyrus of Hunefer. “The mummy in the tomb” is the fourth room. On display here the burial systems, consisting in mummies, and magical elements like amulets and statues. To be highlighted here is the Mummy of Katebet. Fifth room the “Landscape of hereafter” the tomb was considered an interface between the realm of living and the one of the dead. For ancient Egyptian the netherworld was represented in the “Senet”, a popular board game, considered to express many metaphors of the afterlife. The sixth gallery is “Empowering the dead” because magic and rituals could give powers to the dead to avert many dangers in the netherworld. 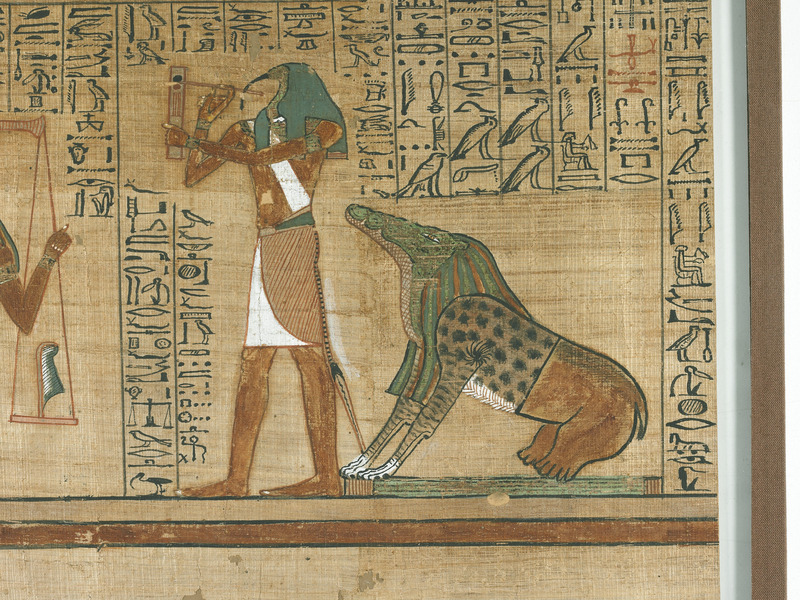 The following gallery, in fact, “Avoiding disaster” deals with the many ways to avoid dangers often represented by monsters or animals of everyday life in ancient Egypt. As on display in the eighth room“Judgement” was the last step to obtain the eternal life. In the Hall of Two Maats, the heart of the deceased is weighed and it is decided if he is allowed to eternal life. On the contrary the deceased is given to the Devourer to be punished. So “The perfect afterlife” could be achieved as in the ninth room displayed. The paradise is called the Field of Reeds where copious crops grow and gods and blessed dead live in peace and happiness. The second last gallery the “Making of the Book of the Dead” displays materials and objects used to create a book in ancient Egypt, like scribal knives, writing palettes and pens. In the last gallery exhibition ends with the astonishing 37 metres “Nesitanebisheru’s Book of the Dead” also called the “Greenfield Papyrus” that leaves speechless. The well known question “What happens after death?” anyone poses to himself during his life, found in ancient Egypt answers with very detailed descriptions. It was possible to find monsters, evil animal, weird gods, and eternal pain or, after a judgment, go to paradise. For ancient Egyptian death was a passage to another world. For them the cosmos consisted of earth, sky and netherworld. A person was thought to consist of physical and spiritual aspects that split from each other on death and to obtain eternal life they had to be reunited. The corpse had to be preserved by mummification and the spirits had to be sustained by magic. It worth say afterlife world in ancient Egypt was ruled by two gods, Ra and Osiris. Ra, the Sun god, was the creator of the world. He travelled across the sky by day and each evening when the sun sets in the West, Ra undertake a symbolic death. During the night Ra makes a journey through the Duat, the netherworld, and reborn at dawn on East horizon. For this Egyptians thought life was an eternal cycle. They considered life after death was strictly interwoven with their everyday life. They believed the challenges to face in the netherworld were comparable to those experienced in life. Osiris, the god of the Dead, was the ruler of the netherworld. Osiris had the power to grant life, including sprouting vegetation and the fertile flooding of the Nile River. Initially the Kings of Egypt, but later on all people, were associated with Osiris in death, as he rose from the death they would, in union with him, inherit eternal life through a process of imitative magic. 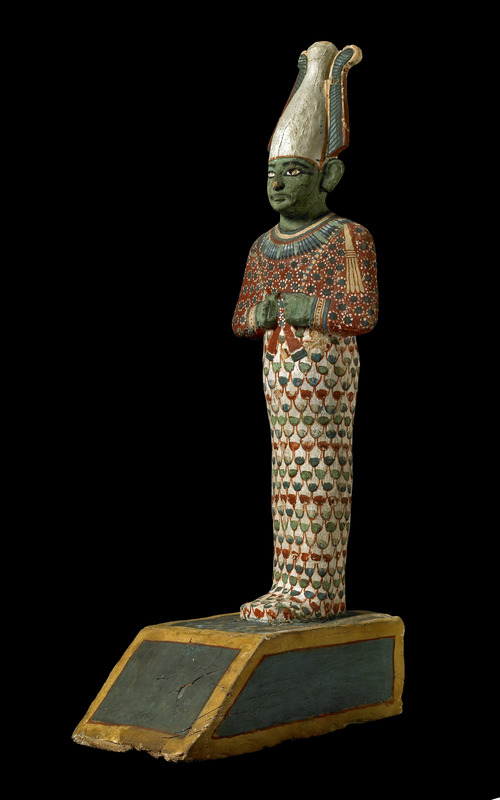 Osiris was widely worshipped until the Christians era. The Book of the Dead was the result of a long evolution starting with the Pyramid Texts of the Old Kingdom through the Coffin Texts of the Middle Kingdom. Many parts of the Book of the Dead are derived from these earlier texts. This exhibition isn’t an end in itself, there are also other related events like talks, films, lectures, activities for families, courses, workshops, study days.